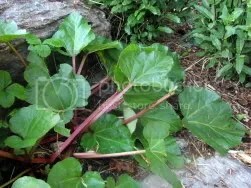 Rhubarb is a lush addition to the Early Summer Garden . . . Seasonal eating gets a lot of press these days. Usually it’s in the context of eating locally, since the two go hand in hand. Sometimes it’s in the context of saving money, since seasonal produce is less expensive than produce grown in greenhouses or shipped from different climates. Rarely is there mention of the best reasons to eat seasonally: because it makes mealtimes easier and tastier as well as more interesting and fun. This month’s Beef and Onion Saute with Rhubarb Gratin is a good case in point. It is based on a recipe for Rhubarb Khoresh that I clipped from the newspaper years ago–long before seasonal eating became a common kitchen term. Nevertheless, the recipe writer knew her seasons. This became clear when I struck out into the rain last week to harvest the rhubarb from my garden, then the parsley, and then the mint called for by the recipe. So there were the three main ingredients, all in their prime, in the garden, at the same time. That’s seasonal sensibility. The resulting dish was obviously local and economical, but it was a pleasant surprise to discover, once again, how well the season’s flavors melded together. That’s where the easy and tasty part comes in. It may seem splendid to have practically unlimited options in terms of grocery store produce and recipes; little do we realize how burdensome is the flip side of unlimited choice. Somebody has to sift and think through hundreds of options to find just one thing for dinner! With seasonal eating, however, only a dozen or so items are in their prime each month, which automatically narrows the options to a manageable range. Better yet, what’s in season almost always tastes great with whatever else in in season, even with a pairing as odd as rhubarb, parsley and mint. So it’s easy to come up with tasty meals. Now for the fun and interesting part. 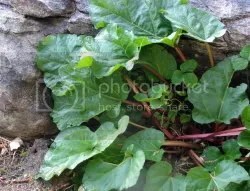 In late spring to early summer, rhubarb is everywhere. That may seem like a sure recipe for boredom. 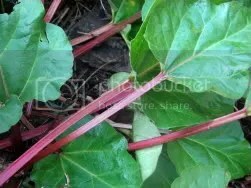 After all, what else is rhubarb good for besides strawberry rhubarb pie? Just as necessity is the mother of invention, however, a commitment to seasonal eating is the mother of culinary innovation. Who would have known rhubarb has a savory side? Who would have used it to brighten up a beef and onion saute with springy, tangy sweetness after all the long months of winter? Only someone dedicated to maximizing the bounty of the season, rather than being lured by the siren song of grocery store tomatoes, eggplant and peppers shipped in from warmer climates. Their time will come in Colorado, and they’ll be filled with juicy goodness, but not now. Now is the time for rhubarb’s springtime punch. So be sure to try the stew right away, while there are still a few coolish days when a warming beef dish has appeal.